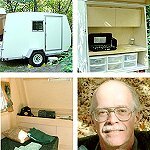 Teardrops n Tiny Travel Trailers • View topic - Is this a good trailer? Is this a good trailer? Stow this folding trailer just about anywhere--it only takes up 2 ft. x 5 ft. 3'' of floorspace! Steel frame has built-in slots for stake siding (stake sides and trailer contents not included). Add your own plywood decking for a 4 ft. x 8 ft. bed. Bed tilts all the way to the ground for easy loading. Easy assembly. Max. load capacity: 1175 lbs; Axle thickness: 5mmOverall dimensions: 140''L x 61-1/2''W x 19-1/4''H; Weight: 287 lbs. Its only 250 so the price is looking good but is this the right trailer to be using? You've got to remember that even if the trailer itself is flimsy, the body will add a lot of rigidity. Yes, many tears have been built on that trailer. That's the trailer I'm using, Derek--and Jack, I hear you about the tires. It's just that I know I'm not going to be driving long distances. (I hate driving, and I go nuts after just 2 hours.) But even those that have driven long distances with this model, no real problems as long as you're real careful. But you're right--I wouldn't want to go cross-country with it. By the way, Derek--Kuffel Kreek has a special link on their site specifically about building their Cubby TD on this Harbor Freight trailer. According to their plans, though, you don't assemble it per the instructions. You take two of the steel cross memebers and insert them into the SIDE rails to reinforce them.You then create a wooden center cross member. And if you can find a Harbor Freight store near you (do a search on their site), the store prices range from $179 to $199. Yes, even cheaper than the web site. If I were to change the tires then what tires should I get and where? And what is the Kuffel Creek Website? Click their Home button to get a good all-around insight into TDs. I'm building from their Cubby plans, and although I've often complained about the plans (because I didn't understand a lot), general consensus is they're very good, and it gives you the "big picture." However, if you want to go with larger tires, you would have to change the spindles as well. These tires are a 4 bolt pattern, where most are 5. So, if you're thinking about doing this now, I would say make it easier on yourself and just buy a better trailer in the first place. Like I said, for me--and the short trips I'll be making--my 12 inch tires will be fine. Tractor Supply has a 4x8 'no floor' or is it 'no bed' trailer for under $300.00 that has a 5 bolt wheel (still 12", but probably could be changed) I think you would have to cut the fenders off to put a larger wheel/tire combo on it. The is a thread about this trailer somewhere on this site, or at least a discussion in one of the other threadss, try to do a search on maybe 'no floor' or something similar. Yeah, there's a lot to it, Derek--so if you want the 5 on 5 pattern with 15" wheels, get that in the first place. I just went cheap because I didn't know what I was doing (I used that Kuffel story as my only source of info)...I WAS cheap (and broke at the time)...and I started building this on a complete impulse. Ignorance never stopped me from trying something new before--so why would it now? Here is a photo of the Tractor Supply trailer. I've got a Harbor Freight 1175# trailer on raincheck. Has anyone added Bearing Buddies to this axle? Is it possible? I would feel a lot better about long trips with Bearing Buddies and a load of grease in place. I've got a boat trailer with 8" wheels that has been across the country and many other long distance trips cruising at 70 plus MPH with no problems thanks to the Bearing Buddies. Anybody know what size BBs to use? Thought I'd tack on to this conversation. Up until yesterday, I assumed I was gonna go with a bolt together from Redtrailers.com - very similar to the one above, but a bit wider. Now, I'm reconsidering, primarily because I live in Colorado - lots of mountains and dirt roads, and I'll be hooking it to a my Land Rover, so it may want to go off road a bit. Nothing to treacherous mind you, but not the paved asphalt.